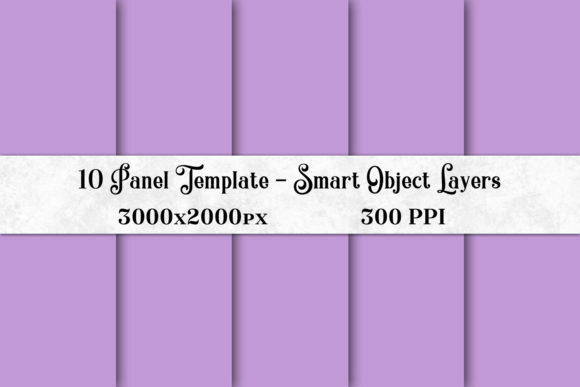 This is a very simple 10 panel template that utilizes smart object layers. The way it works is, you can open the smart object layers individually and paste your content into them (I do this by putting the content on a new layer in each panel). When you save them, it loads the sections into the main template. I also have one layer at the top of the document which is just a decorative strip that will provide a background to any text you want to include. I created this template using Photoshop CS5 and it works up to the most current version of Photoshop CC. It’s suitable for commercial use and measures 3000x2000px (at 300 PPI). It’s a .PSD file compressed into a .ZIP file. (When you open the smart object layers, they open as .PSB files). These require Photoshop CS5 and up.